In the earlier days, joinery was done with the tools that had to be manually operated. The capacity of these tools was low and it took a long time and effort for making a single piece of furniture. However today we have the option of using joinery machinery. This machinery has a motor, which works on electricity or oil. It not only saves time and effort but it also does a better job. Some of the common joinery machinery is table saw, planer, drilling machine and spindle molder. There is a lot of variety available for the size and capacity of these machines. They can be selected according to the job for which we want to use them. The table saws can be called as the most useful of the joinery machinery. There are two types of wood saws available. They are the ones with a fixed base and the second ones are those with a moving base. The ones, which are mounted on the table, have a fine grove to on one side of the blade. It is from here that, the crosscut angle will move. In addition, a fence, which guides the wood for cutting, is attached to the same side. This machine is useful for giving cuts in parallel to the sides of the wooden piece. On the other hand, the sliding table saw slides over the table on which it is mounted. Therefore, we can cut a wooden piece placed it. It is very popularly used for cutting flat panels of wood. 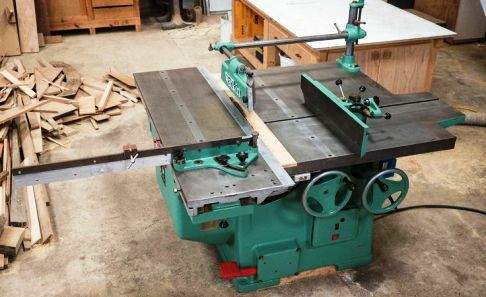 Planer jointer is joinery machinery used for flattening and smoothening of the work piece. It has blades that rotate in the horizontal direction. It also has guiding fence, which will facilitate to give the work piece, a 90-degree cut. Thicknesser is used for cutting the wood to provide it a uniform thickness. This can be done by smoothening of the wood piece with its help. It is not useful for making the work piece flat. Stationary drill press as the name suggests is a drilling machine. It facilitates making holes quickly and without any effort. The stationary drilling machines facilitate to make holes that are more accurate. However, the non-stationary machines are more popular due to lightweight and their portability. Spindle molder is the machinery used for larger workload. It works in the same way as the router. However, it is heavy-duty machinery. The tools that it has are of high speed and high capacity. If it is combined with the feeding machine, it will be one of the most useful joinery machinery. Band saw is another type of joinery machinery. It is excellent for rip cuts. It is also ideal for having fast cuts. The round cuts, which are to be so precise, can be done with ease using this machine. A band saw generally has a fence which guides the wood so that it can be cut as desired. Moreover, it has a 'cross can cut bar' as well, which allows cross cuts as well. These are some of the joinery machinery available these days. Constant improvements are taking place and hence the capacities, as well as the features of these machines, are improving. Professional Plumber in London serving London and the surrounding area successfully for years.